Some times I feel,Stocks act like human beings. Few are restless with huge volatility and others are lazy to move. An intelligent investor should understand the nature of the stock before his investment.This is not something that can be picked from the news or the trading terminal.The nature of a stock can be understood by looking it’s historical price movement. The stock that rapidly rise during a rally, sometimes even faster,is like an angry young man. Technically, this type of stocks have a high beta value. Beta gives us an idea as to how much the stock price would fluctuate with the indices. A beta more than 1 implies higher volatility for the stock. For instance, a stock with beta 1.2, means that it moves 20% more than the index in the same direction. When the market falls, we can expect bigger crash in this type of stocks. Most of the real estate stocks are having high beta value and ,at the same time,many public sector stocks are having low beta value. When the beta value is less than 1, the stock price does not move enthusiastically with the indices. Even when the market is falling and the indices are dipping, such stocks show little to no movement in prices. These cool headed ones are not appropriate for short term trading or immediate profit making. At the same time, in the long term, such stocks are seen rising above the valuation.You can see so many low beta stocks in sectors such as IT ,Power, Pharma and consumer goods. Then there are what I call the Go-Givers,the stocks that consistently yield dividend,bonus or capital appreciation for the investors. Such stocks are sometimes observed to rise, even when the market indices dip, although only strong positive market sentiment can bring about consistent value appreciation.Studying price range of different stocks help us to identify the nature of stocks. But merely looking at daily or weekly fluctuation is not enough- to do this, you should at least look at the annual trend or market sentiment. 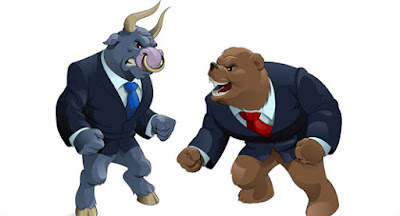 By Comparing the stock chart with the index chart of Sensex,Nifty or sector indices, you can understand the nature of a stock. As per my experience,When looking at a stock whose price has been falling for a long time, you should look at charts for the last three or more years.Weekly and Monthly time frames can contribute more for long term analysis of market sentiment.For instance, 3I Infotech was traded at INR 160 in 2007 and it is traded at INR 3.90 as of today. People who tried to average this stock again and again,was unaware of this stock’s nature, which resulted in huge capital erosion. When the market sentiments are positive, we see stocks making huge growth over time. Indus Ind bak , traded at INR 50 in 2006 and currently trades at INR 1650, is a good example opf long term positive sentiment over a decade. When trying to understand the behaviour of a stock, market participants should note it’s medium term and long term trend. Means, the nature of the stocks we own, act as a major factor of success or failure in the market. In Life,Insights comes from knowing the reality of human nature or behaviour. Same thing is applicable in stocks too.Having a broad and clear picture about nature of stocks,can help a lot to be an informed investor.